Jack Atkins, 25, of Esplanade, Whitby: variation of community order to include 20 hours' unpaid work over 12 months, plus £40 costs, for failing to comply with community order. David Anthony Eric Frank, 38, of Manham Hill, Eastfield: discharged conditionally for 12 months, plus £80 compensation, for attempting to steal a £9.99 DVD from WH Smith and stealing £80 of razor blades from Wilkinsons. Craig Hall, 34, of Auckland Way, Whitby: community order made, including four-month curfew and drug rehabilitation requirement, plus £40 costs for failing to comply with community order originally imposed for trespassing with intent to steal. Marcus Robert Donlan, 19, of North Marine Road: discharged conditionally for 12 months, plus £29.99 compensation, for, jointly with another, stealing £59.99 handbags from TK Maxx. Kayleigh Leanne Baker, 20, of South Street: community order, including 10-week curfew and rehabilitation acitivity requirement, plus £40 costs, for failing to comply with community order imposed for assault. Ryan Keogh, 23, of Airy Hill, Filey: variation of community order to include 40 hours' unpaid work over 12 months, for failing to comply with community order. David Mundy, of Paradise: variation of community order to include seven hours' unpaid work over 12 months, for failing to comply with community order. Liam Simpson, 21, of Valley Road: discharged conditionally for 12 months, plus £100 costs and restraining order imposed, for sending electronically a message that was grossly offensive or of an indecent, obscene or menacing character. Joshua Alexander Stewart, 20, of Kings Lane, Ebberston: variation of community order, to include Friday hours extension to 12-week curfew, for failing to comply with community order by removing personal identification device for curfew. Mark David Millions, 46, of Northstead Flats: jailed for 18 weeks, plus £80 costs, for using threatening or abusive words or behaviour or disorderly behaviour, assaulting a police officer, theft of a £40 watch from Debenhams, trespassing with intent to steal, and breaching a conditional discharge order imposed for possessing Tramadol, a class C controlled drug, and theft. 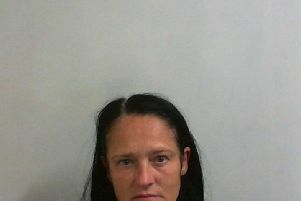 Sarah Ramsell, 37, of Briercliffe: discharged conditionally for two years, plus £115 costs, for attempting to steal £80 of meat from Co-op Stores. Stephen John Atkinson, 54, of St Nicholas Street: fined £40 plus £30 costs for assaulting a police officer and assaulting a PCSO. Shane Craven, 23, of Aberdeen Walk: discharged conditionally for 12 months, plus £15 costs, for stealing a £3.99 wrench from Wilkinsons and using threatening or abusive words or behaviour or disorderly behaviour. Jonathan Marc Hunter, 26, of The Croft, Filey: discharged conditionally for six months, plus £100 costs, for drunk and disorderly behaviour.